With stamping and assembly work for the agricultural industry now accounting for more than half of its production schedule, GMP Metal Products counts on EDI, automation, QDC and other lean-manufacturing tools to efficiently schedule and produce more than 700 different part numbers. 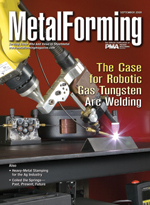 ...does it make sense for your metalforming company? Die springs play a critical role in determining the quality of metal stampings, and die-spring manufacturers continue to improve spring shape, tensile properties, coatings and tolerances to keep up with increase demands from metalformers.